This band is made of Argentium Silver. 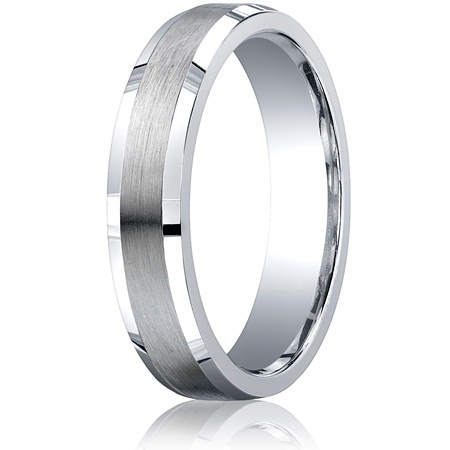 Comfort fit band features a satin-finished center with high polished beveled edges. Width: 5mm. Available in whole and half finger sizes, 6-14. Argentium is the most advanced silver alloy in the market. Argentium silver rings are tarnish-resistant and stronger than sterling silver offered elsewhere. Argentium Silver was invented by master silversmith, Peter Johns, during the 1990s. The patented Argentium formula gives protection against tarnish and firescale and imparts increased ductility, strength, durability and unique hardening properties. Argentium Silver has been independently compared to seven leading silver alloys and has been proven to be the most tarnish resistant silver that is commercially available.